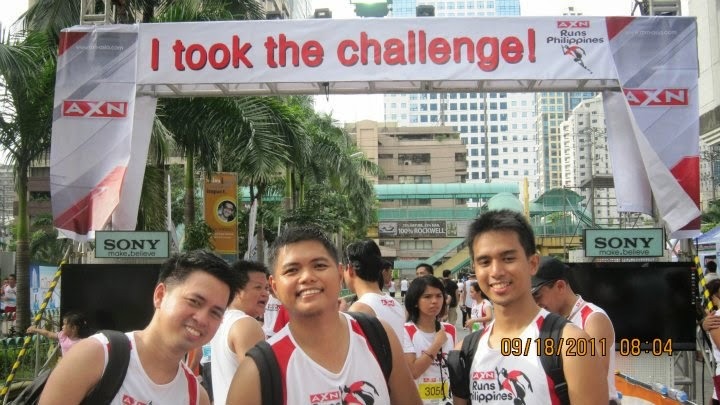 From a 3 week business trip, I went back to running in Fun Run events in the AXN Runs Philippines that was held last September 18, 2011. I joined the 5k category which meant this was my fourth 5k run. Nung una, okay pa yung road eh.. But towards the end, uphill was torture. I was gunning for a sub-30 5k but I didn't really seriously train as I was only running aimlessly around my hotel. So I wasn't able to achieve that goal. Plus, the route was deadly with the uphill near Home Depot. 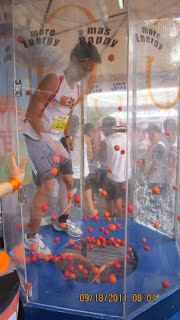 I ran with Dom and Lee in this event. I tried to pace with injured Dom but he was still so fast that I couldn't catch him (Adik lang si Dom na kahit injured eh naka-sub 30 pa rin). There was also a lot of people who ran this event so we started walking at gun start. It was my first time to experience that so that was really annoying. Post race wasn't that exciting as we got a boring loot bag containing only a box of Athena, a specialized milk for women. 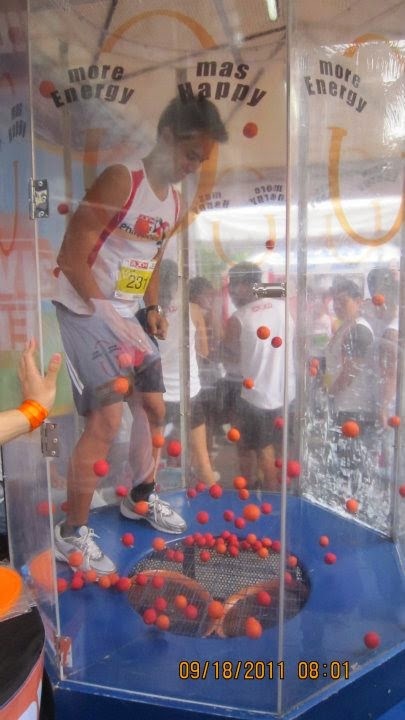 The highlight of the post race festivities was the Enervon-C booth where we played the ball catching game with enthusiastic cheerleaders cheering you on. There were a great number of runners too that why the freebies ran out. Overall, this race was okay. the route was challenging but the start and finish is too congested for that many runners. i agree! sobrang torture talaga ung final uphill before the finish line. i did 21k here, and ilang araw bago ko nakatakbo uli. and yes, loot bag fail. hehe! @deemenrunner: mas grabe pa ata kapag 21k dalawang ikot sa flyover!